Geng Wak Long made its first appearance as a group on a tv program called Nasi Lemak Kopi O in 2008, this launched them into the spot light and through popular demands of the program , Geng Wak Long began performing throughout Malaysia and ultimately became the sound for other tv programs on tv9 such as Apa Khabar Orang Kampung and Suarasa, their success not only made them a household name but ultimately Geng Wak Long managed to bring existence and awareness on a national level to the Kelantanese music , though it began as a commercial endeavors , it became the impetus for the group to keep performing till today. Geng Wak Long might be seen as new in its formation in the eyes of the Malaysian public but what is not known is that Geng Wak Long members are made of experts and long time practitioners in the traditional arts of Kelantan , their commitment to the preservation of authentic Kelantanese music does not waver as they too walks among the many establish names of contemporary music of today ,hence Geng Wak Long is no stranger in fusing the many musical elements of the world through the use of Syncretic Traditional Malaysian Music such as (Ghazal, Malay Asli Music, Malay Gamelan, Keroncong and from time to time even pop music. GWL also has a tremendous body of knowledge when it comes to traditional performances starting from Shadow Play - (Kelantan leather puppet theatre), Dikir Barat, Kelantanese Silat (Martial arts), Makyung, Tari Inai, Asyik, Rebana Ubi, Kertuk, Tarik Selampik, Main Petri@Teri and Kelantanese Traditional ensemble. GWL was founded by Mohd. Kamrulbahri Bin Hussin, who is also known as Wak Long (Wok Long in Kelantanese Dialect), Kamrulhusin is no novice when it comes to music , he is a musician of multi-displinary skill , a Composer, Music Educator, Music Director, Improviser and Artistic Director. He was born in the small village in the state of Kelantan Malaysia called Kampung Banggol Gelang Mas, Pasir Mas, Kelantan (north-east Malaysia). Kamrul believe that the community and the expression of Kelantan belong to the people there , being born into this rich heritage it is not at all uncommon for the whole family to be as diverse as he is , that is also why this tradition is best kept within this family, Geng Wak Long is comprised of his Father, Younger Brothers, His Wife, Sister in Law, Father in Law and his Uncle. By using a pseudonym called Wak Long & Co. or Wak Long Gang (Geng Wak Long), which is based on one of the characters in Kelantanese Shadow Puppet Play. Drawing from the knowledge that stems from these rich traditions of Kelantan, Geng Wak Long performed internationally at festivals such as Penang World Music Festival 2012, International Sound and Light Festival KLCC 2012, International Drum Festival “Kaleidoscope Hand Drum Festival 2013”, Rain Forest World Music Festival 2014 and Borneo World Expo 2014. Geng Wak Long also launched their cultural Centre (Edu-Cultural Tourism) at Kamrul’s village called SANGGAR BUDAYA GENG WAK LONG KAMPUNG BANGGOL GELANG MAS, PASIR MAS KELANTAN. The aim of the space is to provide thephilosophy of school of living traditions, where rather than having these traditional forms removed from their place of origin to a representational stage, the cultural center aims to bring people there to witness not only forms but the daily life of the these traditional practitioners, there they could witness how these shadow puppet and some of the musical instrument such as gendang are made. It is his hope that the space would flourish and set an example for anyone who is on the stead of preservation. Founder Kamrul Bahri Husin hope the group s formation helps to further give an understanding into the state of Kelantan, the culture it resides in and the people who practices them , in most part Kelantanese form cannot be separated from the community of its inception, mostly because Kamrul felt that these form present the expression that stem from the living environment of the people there, the traditionality is very infuse with the daily life that most of these form were presented as a tool for healing for the community it occupy. Over the years academic understanding has been presented and discussed within the realm of education in local universities, the endeavor is admirable , but it has also led to a misdirection away from the practitioners and into the hands of few academics, many book has been written about Kelantan and its traditional expression but the point of view is skewed as the voices of the people were never centralized , rather they became merely tools used for cultural demonstration , and never properly seen as a living breathing thing with expression , opinion and a voice which cries not for acknowledgement but a sense of ownership and entitlement to a form that lives and if anything provide a certain sense of identity to them. 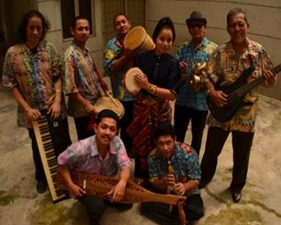 Kamrul believes that the formation of Geng Wak Long is pivotal in paving the way to further refine the expression, he also believe creating the group also help to diminish its deterioration. "I was born into this , my father and the people before him was born into this , it s in our psyche, it s what we breathe, doing otherwise is betraying oneself , betraying nature , I have to keep doing , making and believing, it s something that will be passed to my children and it will not wither with time , not as long as I breathe, not as long as people believe, my expression and the people may go through hard time but they will endure and they will never forget "( Kamrulbahri Hussin).